The concept behind this trash can is great: lightly touch the front bar and the lid opens. Gently push the lid down and it closes. I received the can one week ago and it functioned well until the past few days when the lid has taken on a life of its own. Now nothing keeps the lid closed. Push the lid down and it almost instantly pops open. 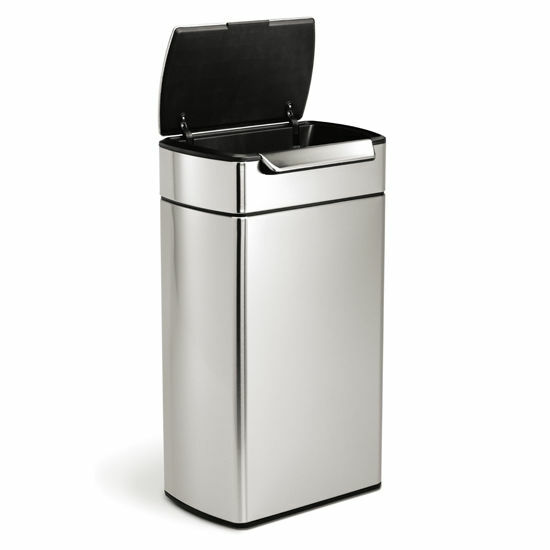 So I have an open trash can all the time–not exactly aesthetically appealing! I feel like much of my time is spent helping people to manage expectations. Have you ever heard the common wisdom that serenity is inversely proportionate to expectations? That’s a clumsy way of saying, “Get a clue!” That nice quiet girl, who kept her lid shut during those first dates, pretending to be interested in your fantasy football team or the sibling rivalry with your attorney brother, will naturally take on a life of her own once ensconced in your home. And, she should! It seems like you think she can be controlled with gentle touches, like the woman in your iPhone. Perhaps you were fooled by the “simplehuman™” t-shirt she wore when you first met? That wasn’t a label! It was an ironic push-back against a complicated yet shallow world. Or, something like that. The point is, real people are complex and they have a lot to say, some of it, perhaps most if it, pure garbage. I’m not sure what her open lid has to do with aesthetic appeal. Perhaps she’s talking with her mouth full or chewing with her mouth open? Or, maybe she has really bad teeth. If that’s the case, then I would put her out on the curb on Wednesday, before 7:00AM, or you’ll be stuck with her until next week.